Last October while we were in the USA, we attended the International Conference on Missions (ICOM) in Richmond, VA. One of the workshops I attended was on Disciple Making. The presenter, Dann Spader, opened the workshop with a testimony. When we was younger and attending Bible College he was told to buy a book, Harmony of the Gospels. He did and he read through it as he studied the life of Jesus. Making disciples has always been an interested concept. I truly feel we are not doing a good job. Disciple making is a buzzword in the church today. All churches will boldly proclaim they are making disciples. As I survey the church of today, I ask myself are we really making disciples? What does it really look like? How do we measure disciple making? Who is responsible for making disciples? Dann Spader’s workshop was intriguing as I sat there to listen as he presented how to make disciples during his 1 hour class. What is disciple making? The basis is multiplication. You as a disciple, teach and train others to obey Christ thus you make disciples. However, that is not multiplication. Disciple making comes in when disciples reproduce and make more disciples. If you teach and train others to obey Christ but those you trained don’t teach and train others, then disciple making fails. Remember, it is about multiplying. Dann’s message and challenge was, we need to study the life of Jesus and what better way than reading the Harmony of the Gospels. 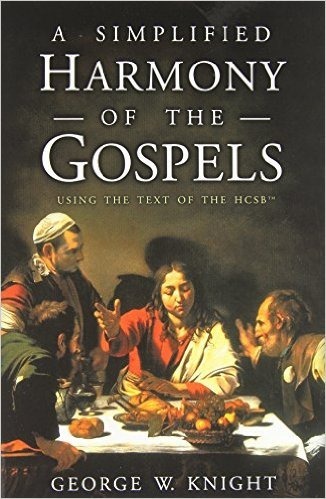 I did some research and bought ‘A Simplified Harmony of the Gospels’ by George Knight. It is based on the Holman Christian Standard Bible, a modern English translation. The book starts with John the Baptist preparing the way for Jesus and ends with Jesus’ ascension 40 days after his resurrection. It takes the four gospels and presents one simplified gospel. I started to read the life of Jesus when we returned to PNG in January. I just finished reading and studying the life of Jesus this past week. I did learn more about Jesus and His life story of making disciples. This book is only a building block cause there is so much more. Reading, studying is one part but application is why we earn our marks. How am I going to apply the life of Jesus and His ministry into my life as I try to make disciples?